There's a rebirth in hometown dentistry. Benson Family Dentistry provides comfort and service with the latest advances in dental technology. Folks come to see Dr. Brian M. Benson III because of his caring and friendly manner as well as his training and skills in a variety of dental specialities. 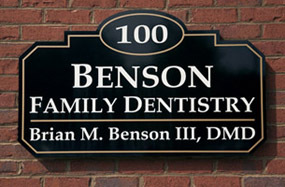 Located in Travelers Rest, Benson Family Dentistry offers general, cosmetic and family dentistry. We tailor our care to our individual patients. If it's been years since your last trip to the dentist, we won't judge you. All smiles are beautiful to us, and our caring and professional staff will develop a treatment plan that matches your goals for your health. Your smile is in good hands with an experienced doctor who will not only diagnose and treat your needs, but also counsel you on oral health and preventive care. On behalf of all of us at Benson Family Dentistry, we look forward to meeting you and your family. Call (864) 834-2774 to schedule an appointment.